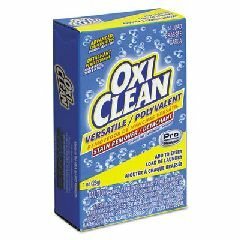 Presoak and boost right with OxiClean water-activated, oxygen-based stain fighter. With vend-boxes, you can provide maximum-strength performance in a convenient, money-making format. Color-safe and chlorine-free. Application: Laundry Pretreatment; Applicable Material: Fabric; Dirt Types: Food Stains; Grass Stains; Grease; Oil-Based Soil; Organic Matter; Water-Based Soil; Scent: Neutral. Includes 156 single-laundry-load boxes.